A Passionate and Magical Highland Romance! Scotland, 1230 Sent on a rescue mission, Finn Mac Chaluim is prepared to do his duty, hand over the lass and return home. But fate has other ideas. 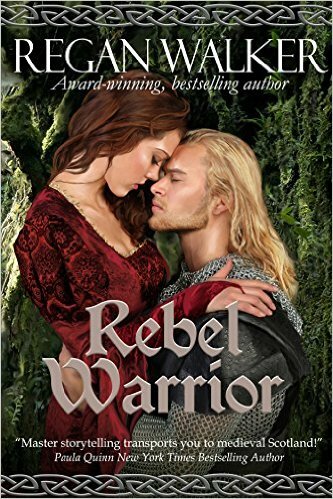 In the midst of a Norse invasion, Catriona barely escapes with her life. Masquerading as her sister, she finds herself in the hands of Finn who intends to hand her over to her sister’s betrothed, Laird Gillean. In the interests of bringing peace to her home, Catriona is determined to continue the ruse—even if it means going along with the marriage and denying her growing attraction to a man who keeps his hurts hidden behind a quick grin. If the green faery, Tèile, has anything to do with it, Catriona and Finn will come together—but only at the right time. Thanks to her last attempt at matchmaking, many paths were changed and now it’s up to her to put it right. Can she help Finn— who learned the hard way that sharing your life with someone only leads to heartache—get past his doubts? And will the battle-scarred Catriona even accept him into her heart? When Laird Gillean’s attentions toward Catriona become dangerous, both Finn and Tèile will find they have an uphill battle on their hands. Passion combines with danger, faery magic and subterfuge in To Dream of a Highlander, another sensual Highland romance from Samantha Holt. I found it to be another super read from an author who never fails to deliver in whatever genre she is writing in. Finn, who appears in the previous novel, To Steal A Highlander’s Heart, is a hero whom I very quickly fell in love with. Despite his jovial manner, this handsome warrior is still mourning the loss of his first love, his wife who died in childbirth. When Finn first casts eyes on Catriona, he feels that she is familiar to him somehow, and comes to realise that she is the very woman who has been haunting his dreams…..
Finn believes that Catriona, who unbeknown to him, is masquerading as her twin Katelyn, is destined for another. He is constantly at war with himself over his wild attraction to her and his fear that he cannot let himself love again, being convinced that he failed his first love. However, when he realises that Catriona is in danger he will do his utmost to protect her, laying his life on the line. I just loved how the author portrayed Finn’s inner struggle and really felt for him throughout. Catriona is both a strong yet vulnerable heroine and I immediately admired her bravery in coping with the bloody and brutal Viking attack on her father’s keep. Although in the initial confusion she at first fears that Finn is another Viking, she is drawn to him, due to his thoughtful behaviour, easy humour and the care he takes of her. Once she realises that he is her saviour she finds it difficult not to succumb to her attraction. It is Finn she turns to for support as she strives to cope with the memories of the attack on her childhood home and person, a traumatic experience that plagues her. The scenes between the couple are both tender and passionate as they both struggle with their own inner demons, but neither can deny their mutual attraction for too long! Sexual tension is high and passion refuses to be denied between them, and they come together in a number of scorching swoonworthy scenes which I LOVED! Catriona is determined to put the safety of the people of Bute first and continues to masquerade as her sister, even as she places herself in danger, for it seems she cannot escape the impending marriage to Laird Guillem. Will Finn put his fears aside and realise Catriona is destined for him alone or will she belong to another who may not have her best interests at heart? Also how will he and her prospective bridegroom react to Catriona’s deceit? The antics and magic of the faerie Tiele, tasked by the Sidhe Council to bring Finn and Catriona together, are pivotal to the plot and are often amusing in the effect that they have on the couple, particularly Finn! Once again Tiele finds that the hearts of humans are far from easy to control. The supporting characters were well portrayed, in particular the widow Lorna, Finn’s sister, and her brother-in-law, Lord Guilleam who is her overlord and Catriona’s betrothed. 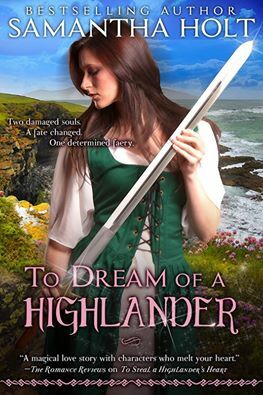 To Dream of A Highlander is another awesome read from this author and I recommend it to lovers of sensual historical romances, especially those who love tales featuring hot Highland warriors and feisty heroines!